In the laboratory, a commercial neem-based insecticide—Nimbecidine®—was evaluated as a potential pest management tool for the terrestrial snail, Monacha obstructa (Pfeiffer, 1842) (Hygromiidae). 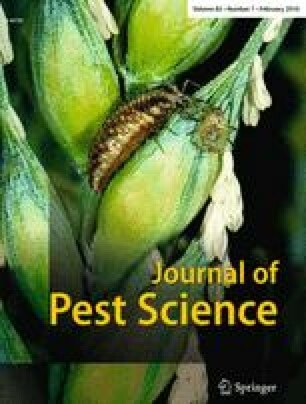 Effects of different concentrations of the botanical insecticide on food consumption and egg hatchability of the terrestrial snail were studied. Generally, food consumption of immature and adult snails decreased as the concentrations of Nimbecidine® increased. At the highest concentration (10 ml/l), the snails avoided contacting with food completely. The food intake of immature individuals was significantly (p < 0.05) more affected by the Nimbecidine® treatment (at 1.25 ml/l) than that of adults. LC50 of Nimbecidine® for the treated eggs was 2.18 ml/l, and eggs failed to hatch at concentration of 10 ml/l. Nimbecidine® showed sufficient biological activity against the food consumption and eggs viability of M. obstructa, thus the preparation has a potential to protect field crops from this pest snails. The authors thank T. Stanes & Company Ltd, Coimbatore, India for providing us with a free sample of Nimbecidine® for this research work.